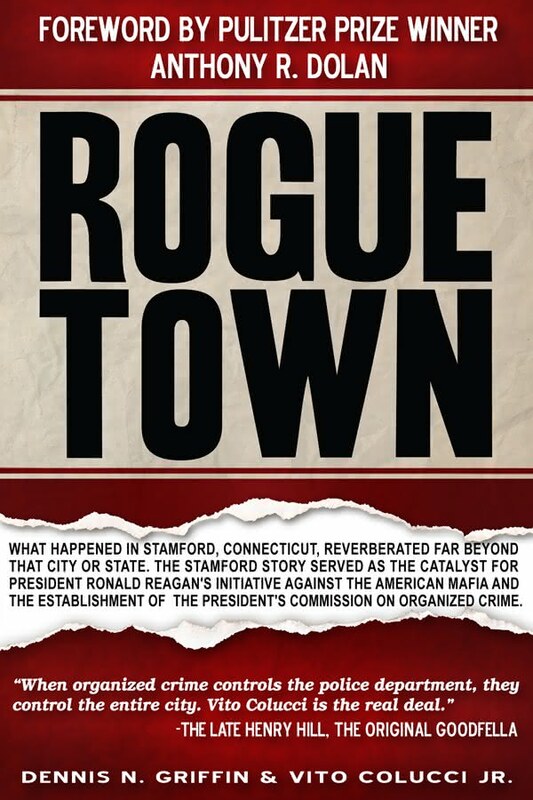 "Rogue Town, by Dennis N. Griffin and Vito Colucci, Jr., is the true story of Stamford, Connecticut, a city that from 1965 through 1985 was under the stranglehold of organized crime and run by corrupt officials, it was known as one of the most corrupt cities in the country. Disgusted by what was happening in his home town, Stamford police officer Vito Colucci vowed he would do whatever it took to bring the corruption to light. It was a decision that eventually placed him in an undercover role, wearing a wire to gather evidence against senior officers in the Stamford Police Department, and nearly cost him his life. When the dust settled, serious wrongdoing in eight city departments was exposed, including the police department, where a rackets commander was taking $1,800 a week from the Gambino crime family, and a detective sergeant was running the largest drug ring in Southern Connecticut out of police headquarters. Fifteen city and state officials resigned or were fired; police officers, other officials, and organized crime figures were indicted and convicted. And a young reporter for the Stamford Advocate named Anthony Dolan won a Pulitzer Prize for his 75-part series on municipal corruption. However, what happened in Stamford, Connecticut, reverberated far beyond that city and state. It served as the catalyst for President Ronald Reagan’s initiative against the American Mafia and the establishment of the President’s Commission on Organized Crime. "